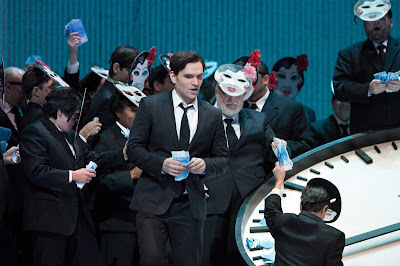 This Saturday’s Live in HD broadcast (11 March 2017) from the Metropolitan Opera was a revival of Willy Decker’s production of Verdi's La Traviata that began life at the 2005 Salzburg Festival. Sonya Yoncheva played the tragic heroine with Thomas Hampson and Michael Fabiano as Germont pere e fils, Nicola Luisotti conducted. As we took our seats there was already a live link to the Metropolitan Opera auditorium where the familiar hum of an expectant audience was audible. The stage was a sparse monochrome. What appeared to be a Cinerama screen dominated the stage. In retrospect, I fancifully imagine this might be the bevelled edge of a time piece. Stage left sat a large clock and a shadowy figure who ominously loomed over the remainder of the proceedings. 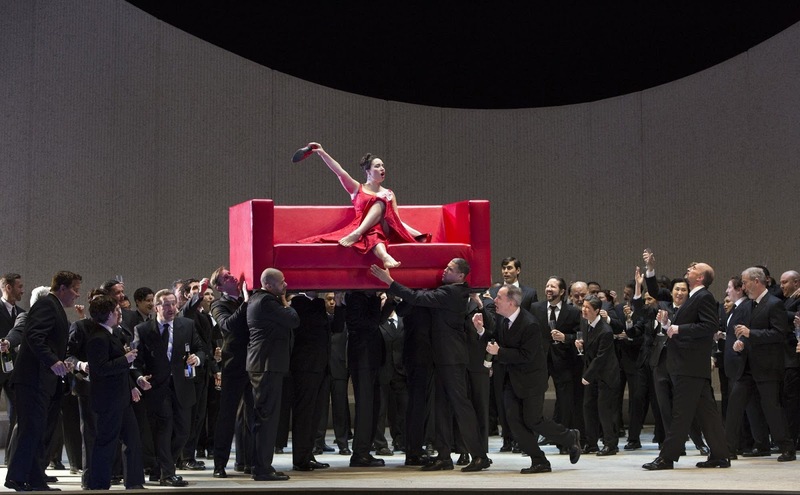 I confess to being ambivalent about live opera broadcasts. On-stage noise can be distracting and close-ups unforgiving, not something you’d be too concerned about if you were in the auditorium. On the obverse you see little touches that you wouldn’t stand a chance of seeing from any vantage point in a theatre. The minimalist undefined space, albeit with heavy symbolism, forced you to focus on the human tragedy. During the Prelude Violetta staggered across the stage towards the clock in obvious discomfort where the gloomy figure presented her with a camellia as she attempted to stop time. 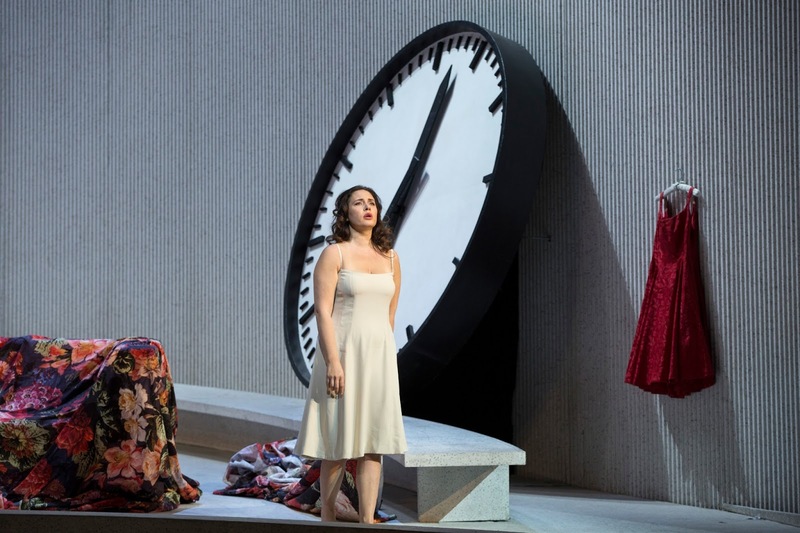 I’m an admirer of Sonya Yoncheva having seen her in the Royal Opera’s Norma (see our review on this blog) and she didn't disappoint. Technically she has what this role requires in spades and then some. I kept expecting the close-ups to reveal the effort that this takes but her seamless legato and luxuriant tone looked effortless. She produced a thrilling portrait of a lamb sacrificed on the altar of patrician hypocrisy. Michael Fabiano had a diffident start and appeared anxious not to take his eyes from the pit. Unfortunately he is not one of life’s natural movers and seemed to be wearing somebody else’s underwear for the first act. It may well have been nerves but it was distracting in close up. Despite this he has the sort of thrilling silvery tone that made my ears ring and he was a perfect match for Violetta. Their onstage chemistry was charming. A pity that the tempi were a little too leaden for my taste. Placing the interval after Act 1 allowed the remainder of the tragedy to unfurl seamlessly. The country house was draped with vivid flowered coverlets, the clock partially concealed. Michael Fabiano now looking and sounding a little more relaxed thrilled in “De’ miei bollenti spiriti”. Violetta and Alfredo played a poignant game of hide and seek; Violetta’s feet poking teasingly from beneath the covers. 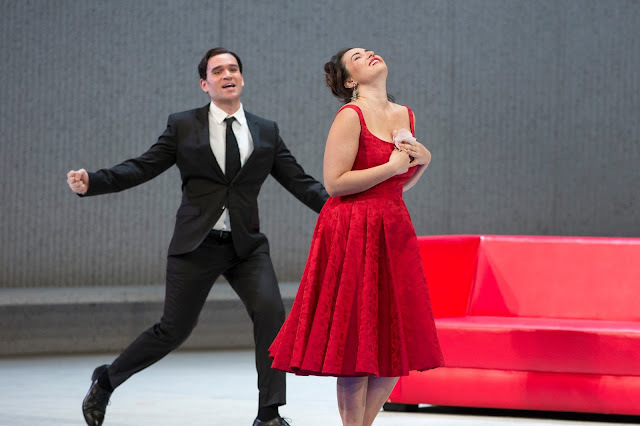 Whilst Thomas Hampson is still a charismatic stage presence his Germont seemed particularly effortful next to Sonya Yoncheva’s intoxicationg performance. Worn down by Germont’s bullying Violetta removes the cover from the clock. “Ah! Dite alla giovine” was heartbreaking. With the reappearance of the shadowy man in Act 3 we came full circle; he was revealed as Dr Grenvil deadpanning “…non le accorda che poche ore”. Violetta’s humiliation by Alfredo, watched over by a menacing Germont from the top of the cyclorama was brutal. The lovers voices now soaring to the final bars, by “Addio del passsato” there wasn’t a dry eye in the house. The audience in the theatre and in the cinema just lapped it up. My only real gripe – a plea to the Met. Please don’t subject us to live artist interviews, they’re toe-curling. The live interviews are fantastic; rarely insightful in any deep way about the music, but so off-the-cuff as to give you an impression of the singers' actual personalities and their feelings in the heat of the moment of just having left the stage. You don't get to see that anywhere else. The Met's unlikely to change it, although they could potentially improve it. Try to appreciate it for the slightly silly but generous, good-spirited peek backstage that it is.